Alexander’s was a former department store chain in the New York metropolitan area. 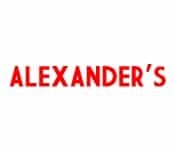 Catering to low- and middle-income consumers, Alexander’s offered discounted designer fashions and high-quality private label goods. At its height, the company operated 16 stores. Its advertising slogan was “You’ll find Alexander’s has what you’re looking for; how lucky can you get?!”. Vornado, a real estate firm (which itself in a previous form was another discount department store chain, Two Guys), bought a controlling share of Alexander’s at bargain prices and refocused the company on development of its land holdings.